In SAP Solution Manager 7.1, Maintenance Optimizer has retired since January 9, 2017. • All critical aspects of landscape maintenance in one tool. Maintenance Planner has been available for our customers since Q2 2015, with sunset of Maintenance Optimizer, Maintenance Planner becomes default tool for planning all changes in your SAP system landscape. For further information refer Maintenance Planner blog , FAQ and SAP TechEd session replay. SEA (Scope and Effort Analyzer) will continue to be supported in SAP Solution Manager 7.1 & 7.2. SEA functionality in SAP Solution Manager 7.1 remains unchanged. Guided procedure to create analysis continued to be supported, product systems are still needed for SEA. Maintenance Optimizer will continued to be supported in context of SEA. For further information about SEA, please refer SEA How-to-Guide, SEA Wiki , SEA Overview . To know more about landscape entities in SAP Solution Manager 7.1 & 7.2 , please refer Product-systems and Maintenance Planner , Landscape entities and Maintenance-Planner , Planning Landscape Changes – a Best Practice Guide . did you already try to run a SEA analysis after the MOPZ sunset? “2413262 – Runtime Error OBJECTS_OBJREF_NOT_ASSIGNED_NO in MOPZ transaction”. Thanks for reporting this, we are looking into it. 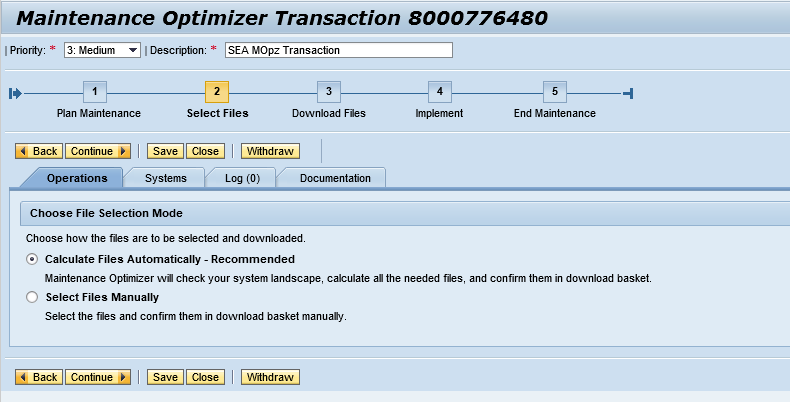 I tried to work with SEA on Solman 7.1 this morning, and with MOPZ sunset impossible to run the analysis. Could you mention for the benefit of other readers what these issue resolutions are? I presume you’re resolving them in Customer Incidents, but others may be getting the same dumps, and if it’s as simple as “Apply Note xxxxxxx,” then we could all save a lot of time by mentioning that here. Thanks for asking this question, issue is fixed on SAP side of the process, no action is required on customer side. Bumping into this issue again this morning at customer side. No options on second step in MOPZ. Can you please look into this on SAP side? Issue is resolved, could you please check at your end.